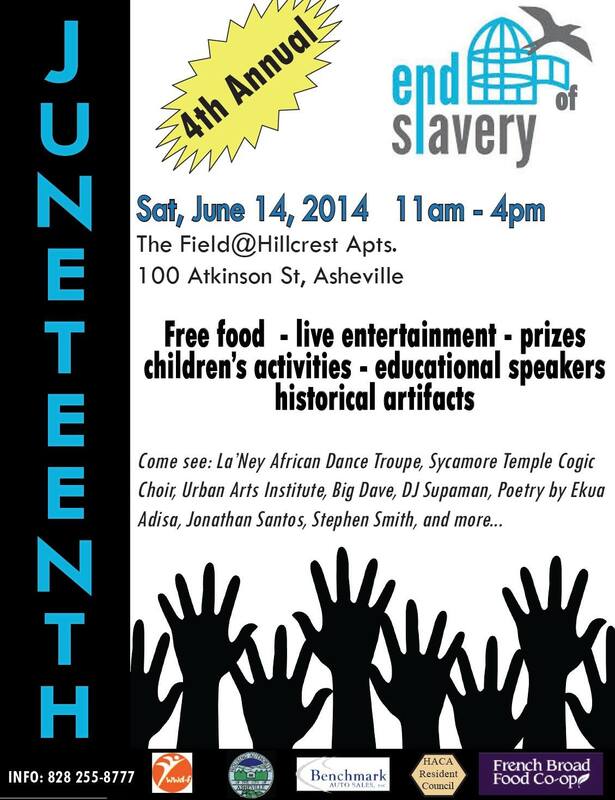 Hey everyone, the fourth annual Juneteenth celebration is taking place on Saturday June 14th from 11 am – 4 pm in the field at Hillcrest! Juneteenth is a celebration of the end of slavery in the U.S., and will be featuring free food, live entertainment, educational speakers, historical documents and artifacts, fun activities for children, raffle prizes, and more! This is a free public event and is very family friendly, so come on out and celebrate! We are looking for the following items to borrow: popup tents, folding tables and chairs, hoses, extension cords, and a generator. We are also looking for volunteers (and sponsors). If you’re interested in helping, please call Nicole at 828-255-8777.